City State of the Invincible Overlord has gone unprinted for nearly a decade. No longer. 1976's City State of the Invincible Overlord was the first city-based campaign module for Dungeons & Dragons, and set a golden standard for city based adventuring in the D&D world and in the fantasy roleplaying hobby. It has done so well, in fact, that it has earned four reprintings for various systems in the nearly forty years since its release. 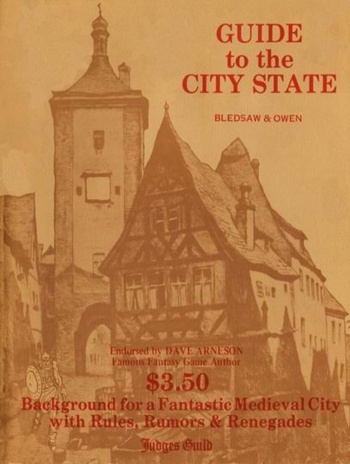 Now, after nearly a decade since the last printing, Judges Guild is relaunching City State through Kickstarter, along with other Wilderlands of High Fantasy products. With versions for both Pathfinder and JG Universal roleplaying game systems, the Judges Guild seems to be hoping to bridge the gap between old and new school roleplayers. Best of luck to that. The Kickstarter campaign includes a variety of really cool old school swag, like large scale maps and miniatures, alongside the book itself. Further, their stretch goals detail a large line of maps and miniatures scheduled out well into 2015, in what would amount to a full scale revival of the 1976 Judges Guild Wilderlands setting. If we should only be so lucky. You should probably go pay tribute at the Kickstarter right over here.